This is an important month, because a host of our partner journals are implementing new policies on data archiving, and, in the U.S., the National Science Foundation is asking its new grantees to have explicit data management plans. There are over 1000 data files from over 50 journals now in Dryad, and much of this content has been submitted only within the past year. Clearly, Dryad’s role in supporting the growing data archiving mandates from journals and funders continues to expand. In the past few months, several new features have been added to Dryad. Users can now save an incomplete submission and come back later to complete it. They can see a listing of their completed and in progress submissions. Users can download data citations to their favorite bibliography management programs and upload them to their favorite social bookmarking tools. A new “faceted search” interface allows users to find data more easily, and also displays related content in other repositories, including ecological and environmental science data (from the Knowledge Network for Biocomplexity) and phylogenetic data (from TreeBASE). To provide an early indication of scientific impact, users can see how often data have been viewed and downloaded. An important new feature is “handshaking”, which is what we call the process whereby authors upload some of their data to Dryad, and the information is conveyed behind-the-scenes to a specialized repository. The aim of handshaking is to reduce the time and effort need to deposit data when there are different repositories managing different aspects of the data. Handshaking also enables persistent linkages among data in the different repositories. As a first foray into handshaking, we now offer users the option of initiating a deposit in TreeBASE, the primary repository for published phylogenetic data, whenever a NEXUS file is uploaded to Dryad. Alternatively, the option is available to deposit in another repository first, and report the identifiers to Dryad to ensure that users can find all the data relevant to a given article. We will be working in the months ahead to handshake with other specialized repositories required by our partner journals. See our recent blog post about these features for more details. Are you looking for a way to show a colleague how straightforward data archiving can be? We’ve added a short (2-minute) video to the site that walks users through the deposit process in three easy steps. The video also available at SciVee. A growing number of journals now integrate their submission process with Dryad, meaning that the repository and journal exchange information to facilitate the author’s data deposition process and to ensure persistent linkage between articles and data. The current list includes The American Naturalist, The Biological Journal of the Linnean Society, Evolution, Journal of Evolutionary Biology, Journal of Heredity, Molecular Ecology, and Molecular Ecology Resources. And more are on the way (stay tuned). Starting this month, the U.S. National Science Foundation is requiring grant applicants to provide a data management plan describing how data will be collected, preserved and made available, and these plans will be subject to peer review. We encourage applicants to leverage Dryad in their data management plans as a solution for the long-term preservation and dissemination of the data associated with their publications. There are some pointers to resources for data management planning on the Dryad website. The Joint Information Science Committee (JISC) in the UK has made an award to Dryad and through Oxford University and the British Library to expand the scope of the journals involved, including into the areas of infectious disease and epidemiology, and to create a UK mirror of Dryad. More information is here and at the Dryad UK site. Interested in keeping up with new data available in Dryad? Follow our Twitter feed (@datadryadnew) or subscribe to our RSS feed. 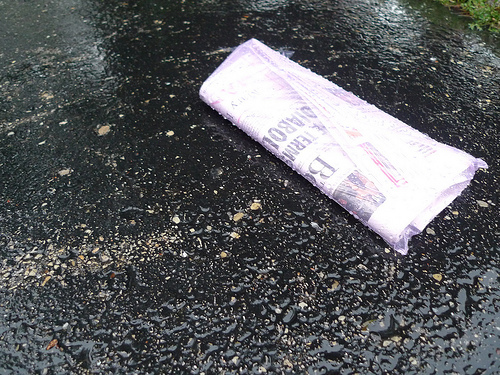 We also Tweet general news about the repository and the world of data science as @datadryad. This blog post is the first issue of the Dryad newsletter, summarizing recent achievements and milestones of the data repository. If you’d like to receive future newsletters by email, please sign up for the Dryad Users mailing list. Researchers working in data-intensive science, as well as science editors and publishers thinking about data policies, may want to take note of a new article by Michael Whitlock, Data archiving in ecology and evolution: best practices in the current issue of Trends in Ecology & Evolution. Whitlock has long been a leader in advocating for data archiving and is the current Chair of the Dryad Consortium Board. In this article he presents concrete suggestions for the what, how and when of data archiving. But archiving is only half the equation. Whitlock attempts to articulate sensible guidelines for data reuse, as well. Under what circumstances should researchers contact the original creators of the data set they are re-using, and when is co-authorship appropriate? How should authors properly acknowledge the original creators of the data? Journals, editors, and publishers have an important role in promoting both data archiving and responsible data reuse. One problem that merits broader discussion is how journals can conduct peer review so as to prevent data misuse. Should researchers be given a chance to review manuscripts that report on new results reusing data that they originally published? Or is it better to avoid the potential for conflict of interest (e.g. “how dare they not replicate my findings!”) and instead recruit independent experts? Although the article is especially timely for those working in evolutionary biology and ecology, due to the recent adoption of mandatory data archiving at many of the leading journals in the field, these best practice recommendations are relevant across the sciences. Michael C. Whitlock (2011) Data archiving in ecology and evolution: best practices, Trends in Ecology & Evolution, 26 (2): 61-65. doi:10.1016/j.tree.2010.11.006. Are you curious about what’s involved in depositing data in Dryad? looking for a quick way to show colleagues how straightforward data archiving can be? 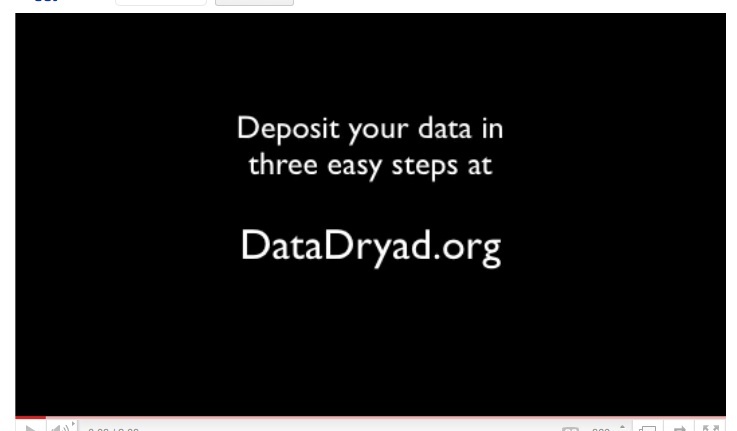 Dryad’s new 2-minute video demonstrates the data deposit process from start to finish. The video is embedded on the Dryad website, and also available on SciVee. Feel free to link to it and share it with colleagues. Statue of Asclepius, the Greek God of Medicine, from the Museum of Epidaurus Theatre. Image from: Wikimedia Commons, Licensed under: GFDL 1.3. An international group of major health research funders have made a “joint statement of purpose” announcing, in strong and clear terms, their intent to promote greater sharing of research data. As public and charitable funders of this research, we believe that making research data sets available to investigators beyond the original research team in a timely and responsible manner, subject to appropriate safeguards, will generate three key benefits: faster progress in improving health, better value for money, and higher quality science. The 17 signatories (so far) include many major governmental funding agencies (e.g. US National Institutes of Health, the Wellcome Trust, The Centers for Disease Control, the UK Medical Research Council, Australia’s National Health and Medical Research Council, the Canadian Institutes of Health Research, France’s National Institute for Health and Medical Research, and the German Research Foundation), private foundations (e.g. the Bill & Melinda Gates Foundation and the Hewlett Foundation) and even international organizations such as the World Bank. The group has invited additional funders to sign on to the statement. To the extent possible, datasets underpinning research papers in peer-reviewed journals are archived and made available to other researchers in a clear and transparent manner. The human and technical resources and infrastructures needed to support data management, archiving and access are developed and supported for long-term sustainability. An accompanying comment in The Lancet by Mark Walport of the Wellcome Trust and Paul Brest of the Hewlett Foundation (Sharing research data to improve public health, DOI:10.1016/S0140-6736(10)62234-9) raises some of the hard, but by now familiar, questions that will drive the approaches taken by the funding organizations: how to balance the rights and responsibilities of data generators and data users; how to safeguard and further the interests of the data subjects themselves; and how to ensure that the benefits of data sharing justify the expense and burden involved.